Palmyra’s Arch of Triumph in June 2010 and the remains of the iconic structure after government troops recaptured the ancient city from IS fighters. The Syrian army has successfully retaken the ancient city of Palmyra from ISIS, but experts suggest that the damage done to the city is, in many ways, irreparable. Palmyra, a UNESCO World Heritage site, was heavily damaged by both Syrian forces and those affiliated with the Islamic State terrorist group. Syria says that it will rebuild Palmyra, but as it has been looted and many of its former treasures are now floating around the black market, a proper rebuild could take a long time. “The destruction of the temples of Baal Shamin and Bel, the funeral towers and the Triumphal Arch are an immense loss for the Syrian people and the world,” said Irina Bokova, head of UNESCO. 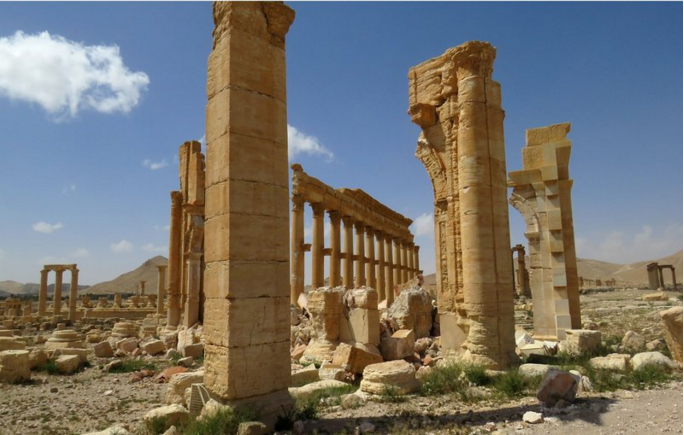 “For one year Palmyra has been a symbol of the cultural cleansing plaguing the Middle East.” Bokova has pledged the UN’s support in recovering the stolen antiquities and in assembling teams to evaluate damage done to the site so that it might be rebuilt. “We will not leave the temples destroyed. We will assess how much damage the stones suffered and we will re-use them in order to scientifically put back the temples,” said Maamoun Abdelkarim, Syria’s top archaeologist, who is working on the project. Palmyra has seen its share of blood in the last year. Captured Syrian solders were killed in the ancient Roman amphitheater, and hundreds of personnel, official, and local women and children from tribal groups despised by ISIS were murdered nearby. Especially awful was the murder of Khaled Al-Assaad, the elderly head of Palmyra’s antiquities, who was killed when he refused to give up the location of the artifacts he and his staff had hidden. Plans for Palmyra’s reconstruction should be generated by the end of April, but the actual construction could take much longer, due to the delicacy and accuracy with which the site must be rebuilt. “The deliberate destruction of heritage is a war crime, and UNESCO will do everything in its power to document the damage so that these crimes do not go unpunished,” Bokova added.